"The superb new production, which opened on Sunday at the Broadway Theater, certainly honors the show’s ebullience of spirit." "Danny Burstein brings exuberance along with wry eyes and an open-heart to his Tevye. His star turn lights the way for everyone." "Burstein has a delicate, almost motherly touch, kibbitzing with God for laughs and tearing out our hearts by the end. No other actor could juggle the comedy and tragedy masks with such style, such a bittersweet dance with tradition." 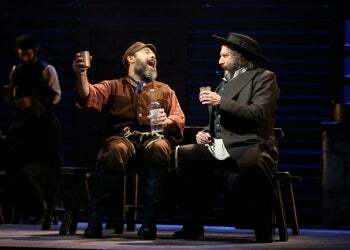 "The 'Fiddler' that opened Sunday at the Broadway Theatre under the leadership of director Bartlett Sher is vibrant and brilliant and heartfelt." "What a pleasure to see a classic infused with fresh talent, intelligence and emotional vitality." "Some may take exception to some of Sher’s tinkering with the template of the beloved title, but few will find fault in Burstein’s gentle, lovable man of faith, family and community. What’s not to like?"